Muzika is a project whose goal is to transform the world of music thanks to blockchain technology. With this platform, musical performers and their fans will become much closer to each other. What problems is this project intended to solve? Currently, music makers and their fans are not receiving adequate rewards for the value they contribute to the music world. Musicians earn very little, despite the fact that many people listen to their music and pay for it. Fans also do not receive due remuneration for various kinds of artist support in the form of voting, cover songs and so on. But intermediaries get all the cream, although they perform minimal work. Muzika is designed to bring balance to the music world and reward talented musicians and dedicated fans. The platform will recover the shares of rewards that were lost due to digital piracy using the blockchain technology. A huge advantage of this platform is the presence of an already operating and publicly funded business, which is used by 2,000 active users and subscribers whose geography exceeds 150 countries, as well as more than 150 artists from 30 countries. 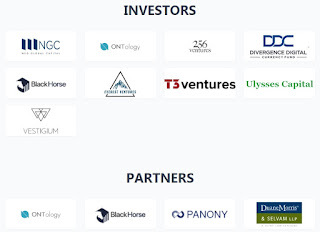 Also interested in the project are large investors and partners, a list of which can be found below. The project team consists of a large number of experienced professionals. We will take a closer look at several of them. Special attention should be paid to the three young co-founders of this project. They are one of the youngest and most successful entrepreneurs in South Korea, whose average age is 22 years. And already at such a young age, they received one of the most prestigious awards of Forbes 30 Under 30 Asia 2018. Inseo Chung is the general director and co-founder of the project. He was fond of playing the piano and even ranked second in the national student music competition. Immediately after graduation, he began to engage in business in the field of e-commerce and social networks. From 2015, he began studying the blockchain technology and is one of the earliest miners of Ethereum in Korea. Sangmin Heo holds the post of technical director in the company and is also a co-founder. This wunderkind, as well as an excellent developer. Already at the age of 15, he earned a small fortune by creating his own web game. He has a huge number of awards for computer science. Jangwon Lee is the chief operating officer of the project and also the co-founder. The best graduate of the most prestigious high school and university in the country. Also has a huge number of awards in various fields of science. Absolutely fluent in such languages ​​as English, Chinese and Korean. The roadmap of the project is quite rich and is listed on the official website until 2020. The project originated in the first quarter of 2017 when its concept appeared and the development of the platform model itself began. Further, in the second quarter, the creation of three different models of the monetary economy of music began. 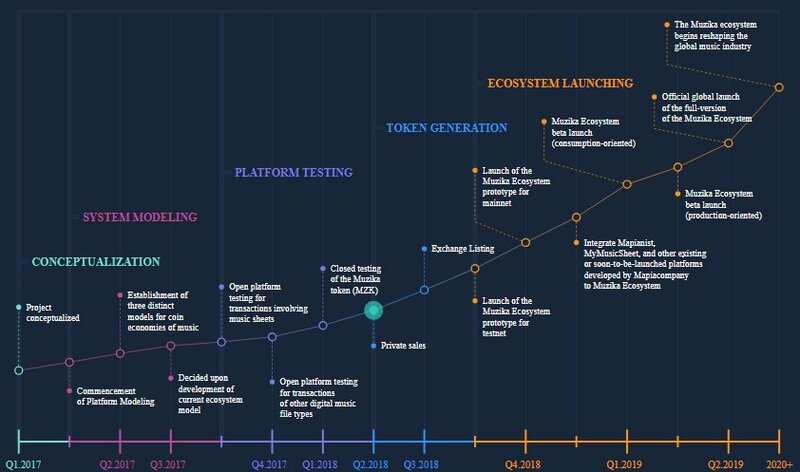 In the third quarter of the same year, it was decided to develop the current ecosystem model and began testing an open platform for transactions with music sheets. In the fourth quarter, an open testing platform for transactions of other types of digital music files was held. In the first half of 2018, a closed testing of the token of this platform took place, and then the private sale of tokens began. In the second half of 2018, the listing of the project token to the stock exchange, the launch of the prototype of the ecosystem for the test network, and then the launch of the prototype of the Muzika ecosystem for the core network will occur. 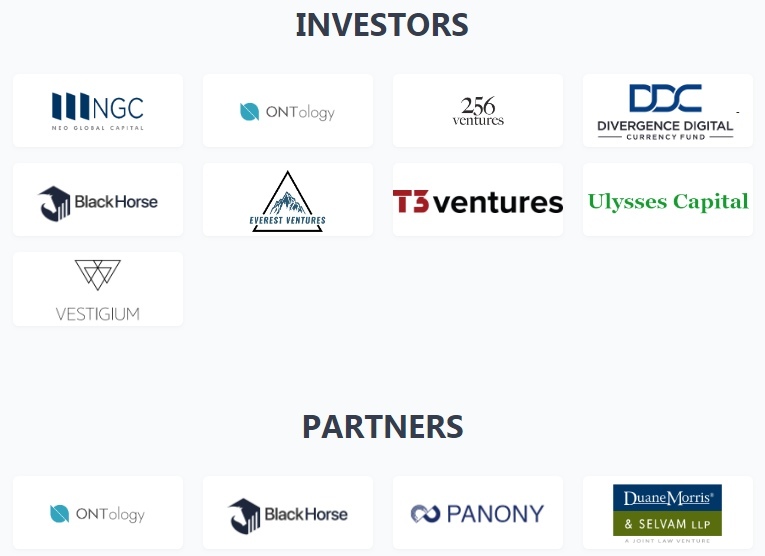 In the first quarter of 2019, the beta platform ecosystem will be launched. And in the second quarter of the official global launch of the full version of the Muzika ecosystem. Starting in 2020, the team has set global goals - the Muzika ecosystem begins the restructuring of the world music industry.